My mountaineering friends call it “bagging a summit”; climbing to the peak of a mountain and adding it to their list of accomplishments. My list is rather modest, in fact Moose Mountain is one of a very few entries on the list. It is a summit for the rest of us. A sea of Rocky Mountain summits fills the western horizon. Getting ready to leave the parking area. 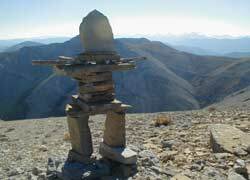 The fire ranger built this Inukshuk on the saddle. It’s easy to get to as you can drive over half way up it. A 7 km dirt road, maintained by Shell Oil, is located about 45 minutes west of Calgary on highway 66, on the right just past the sign for Paddy’s Flat campground. They use the road to build and maintain their gas extraction operations. Sometimes they post a guard there to monitor traffic. You will see their wells perched high up on the rocky slopes around the summit. There is limited parking at the trailhead. Moose is the most easterly Rocky Mountain near Calgary. It takes its name from its profile on the horizon that looks like a moose resting. Driving along highway 1 from Springbank to Jumpingpound, you can see the moose reclining in the panorama of mountains ahead and to the left. It is a massive outcrop of rock, known as Moose Dome, that has a family of peaks identified as east, west, south, north, centre and the main mountain peak at 2437 m (7995 ft). You can access the scrambles and climbs to these alternate peaks from Powderface Trail in the west and the Canyon Creek Road (south). You can also hike in from West Bragg Creek or Jumpingpound. All of this is described in Gillean Daffern’s comprehensive guide to Kananaskis Trails, Volume 2, published by Rocky Mountain Books. The return trip to the summit takes about six hours for casual hikers. I imagine some do it in 2 – 3 hours. 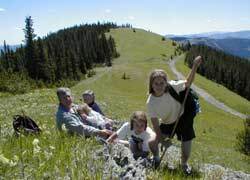 This is a pleasant day hike that provides a unique opportunity to stand on the summit of a Rocky Mountain and survey the sea of peaks to the west and Calgary to the east. 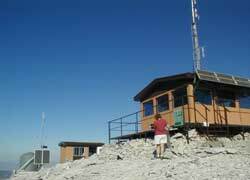 Actually, you can’t stand on the summit, as it is occupied by a fire lookout station. But there is a helicopter landing pad that provides a great viewpoint and lunch spot. The first fire lookout was built by the Bragg Creek Fullertons in 1929. The current structure was built in 1974. It has solar power, radio communications and bottled gas for cooking. It is a private residence that is out of bounds, depending on the preference of the ranger that occupies it from May to September. The station is often hit by lighning and is anchored to the mountain by steel cables. The log book is signed by 2 to 3 thousand visitors per season. The hike to the summit covers 7.1 km with an elevation gain of 477 m (1565 ft). A short distance from the trailhead your ascent is interrupted by an abrupt decline as the trail drops about 60 metres to a dip where the packer’s trail from West Bragg Creek connects. This descent is a little disconcerting as we set out in quest of the summit, but it is even more trouble at the end of a day’s hiking. But we’re soon back to a long and gradual climb through forests with occasional views to our goal, far off over meadows and the Moose Dome Creek valley. About 3 kilometres along the trail we emerge from the subalpine to bare rock above the treeline. It’s getting closer! Just ahead we can see the switchbacks that provide an easy access up a steep slope to the saddle, a broad rounded plateau that leads to the pinnacle atop the mountain. To this point the trail has been wide and packed, but the final ascent is a single track worn into the steep talus slope. It’s a strenuous climb, but it doesn’t take long before you reach the summit and celebrate your success. The views are wonderful. You can see the alternate Moose Mountain peaks in the near distance, an impressive range of peaks as far as you can see and all the features of the front ranges of the Rocky Mountains – sharp ridges, cirques, deep canyons and talus slopes. If you’re lucky, the fire lookout ranger may show you around and answer questions, but they are not tour guides and have serious work to do and their privacy to protect. Spend time resting and admiring the view before starting the long descent. This is a lot easier as long as your knees hold up, but keep some energy and resolve for that steep ascent just before the parking lot. 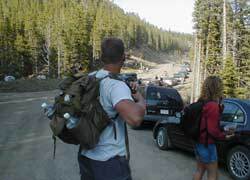 Go prepared with water, snacks and a variety of clothing. The weather is changeable and can be a lot hotter or colder than in the valley. Storms can be very dangerous. If you’re going uphill and the weather is going downhill, turn around. I saw a scar created by a lightning strike, like a large hoe had been raked across the saddle, leaving a shallow furrow about 10 metres long. The Moose Mountain Run has been held in September for many years It’s a rugged, challenging 29 km. mountain marathon starting at the West Bragg Creek Parking Lot. This is an out and back course that follows the Packer’s Trail, with logging roads, switchbacks and mountain valleys. Runners face a total elevation gain of 3000 feet. 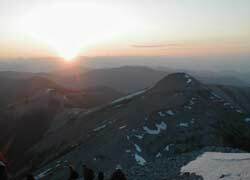 Many people like to do the climb to watch the summer solstice sunset from the summit of Moose Mountain.